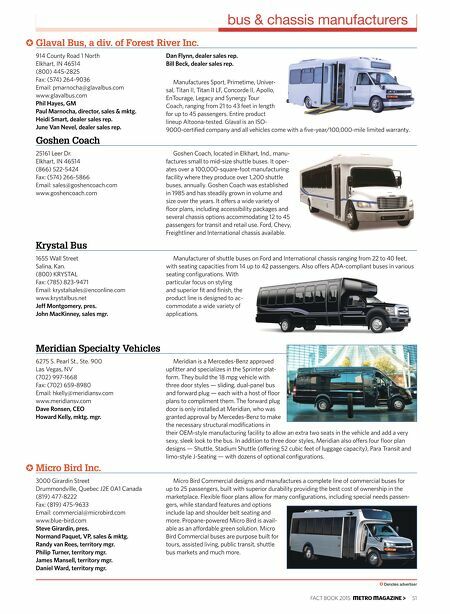 50 < m ETRO m AGAZINE FACT BOOK 2015 metro-magazine.com bus & chassis manufacturers 552 Hyatt St. Gafney, SC 29341 (864) 487-1700 Fax: (864) 487-6400 Email: bryan.henke@daimler.com www.freightlinerchassis.com Bryan Henke, mgr., product mktg. FCCC ofers a complete line of rail chas- sis for transit, shuttle bus, charter and tour, trolley and specialty vehicle applications. All chassis are diesel-powered with an industry best 24/7 factory direct support. General Coach America Inc. 331 Graham Rd. Imlay City, MI 48444 (810) 724-6474 • (800) 331-5761 Fax: (810) 724-1844 Email: sales@championbus.com www.championbus.com John Resnik, pres. Jamie Lipka, VP, sales ISO 9001:2008-certifed manufacturer of small and mid-sized buses. Several brands are available with passenger ranges from eight to 43. All buses can meet ADA re- quirements and most ofer alternative-fuel capability. Denotes advertiser General Motors - Fleet & Commercial 100 Renaissance Ctr. P.O. Box 100 Detroit, MI 48265-1000 (313) 667-1136 • (800) FLEET OP Fax: (313) 667-1159 Email: susan.jagoda@gm.com www.gm.com; www.gmfeet.com Susan Jagoda, natl. bus mgr. General Motors manufactures Chevrolet and Savana Cutaway Van chassis for use in com- mercial markets. This tried and true chassis is ofered with GVWRs from 9,900 lbs. to 14,200 lbs. A six-speed heavy-duty Hydramatic transmission is standard, and coupled with our engine ofer- ings, provides maximum torque at start and extra efcient performance/fuel economy at cruising speeds. A smooth ride is provided by the use of long arm/short arm independent suspension. Three engine oferings — a gasoline 6.0L Vortec, an LPG 6.0L Vortec and a 6.6L Duramax diesel — provide a wide-range of options to ft your transportation needs. The G4500 series features a body struc- ture that meets heavy-duty commer- cial duty cycles, with a 10% increase in metal gauge thickness, added spot welds and structural adhesive on select components. Ford Motor Co. P.O. Box 6248 Dearborn, MI 48126-4207 www.commtruck.ford.com Manufactures cutaways and stripped chassis used in the com- pletion of buses. Gas, diesel and alternative-fuel versions available. GVWRs range from 9,600 pounds to 26,000 pounds. GILLIG LLC 25800 Clawiter Rd. Hayward, CA 94545 (510) 785-1500 Fax: (510) 785-6819 Email: sales@gillig.com www.gillig.com Ben Grunat, dir., national sales Joe Policarpio, VP, sales and mktg. Jerry Sheehan, reg. sales mgr. Butch Sibley, reg. sales mgr. Jim Ryan, reg. sales mgr. 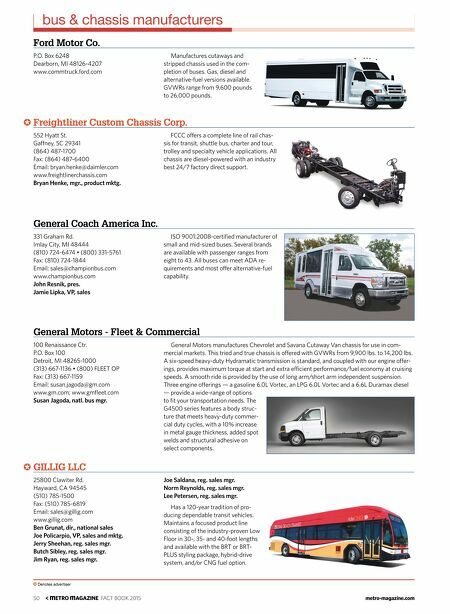 Freightliner Custom Chassis Corp. Has a 120-year tradition of pro- ducing dependable transit vehicles. Maintains a focused product line consisting of the industry-proven Low Floor in 30-, 35- and 40-foot lengths and available with the BRT or BRT- PLUS styling package, hybrid-drive system, and/or CNG fuel option. Joe Saldana, reg. sales mgr. Norm Reynolds, reg. sales mgr. Lee Petersen, reg. sales mgr.